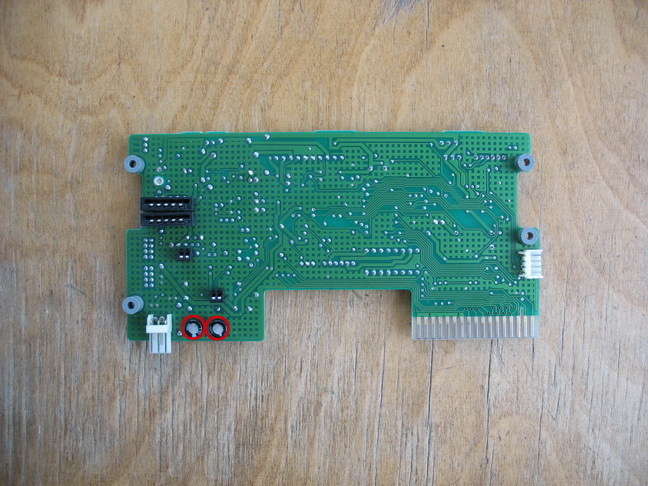 The original capacitors in the X68000 floppy drives will, given enough time, dry up and cease to function properly. 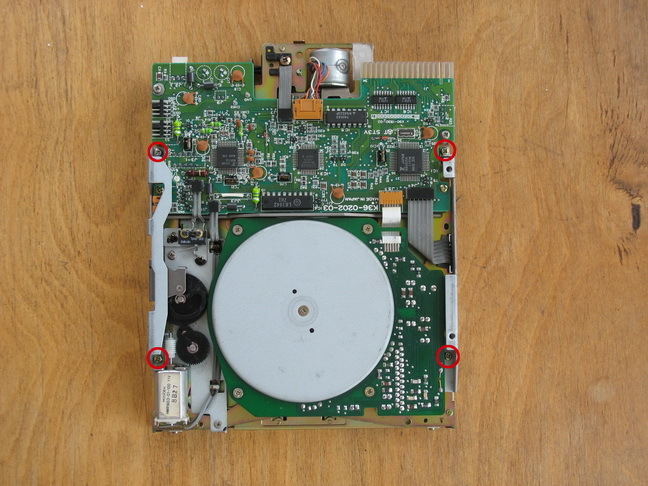 This is not a problem unique to these drives, most electrolytic capacitors will similarly fail eventually. 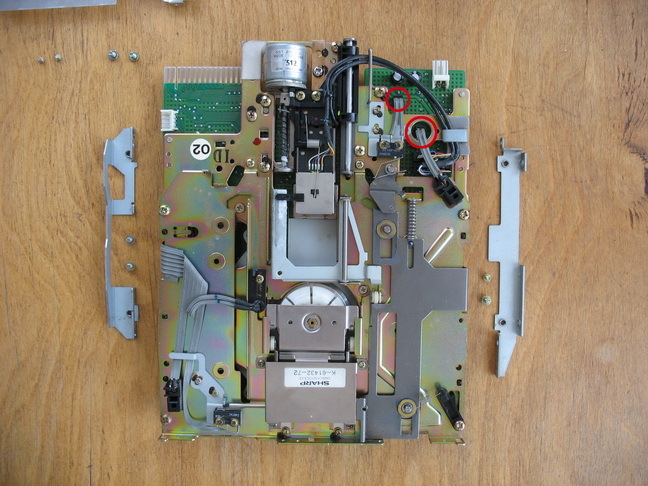 This guide will show you how to replace capacitors in ACE HD floppy drives. Be warned that your problems may not lie in the capacitors. 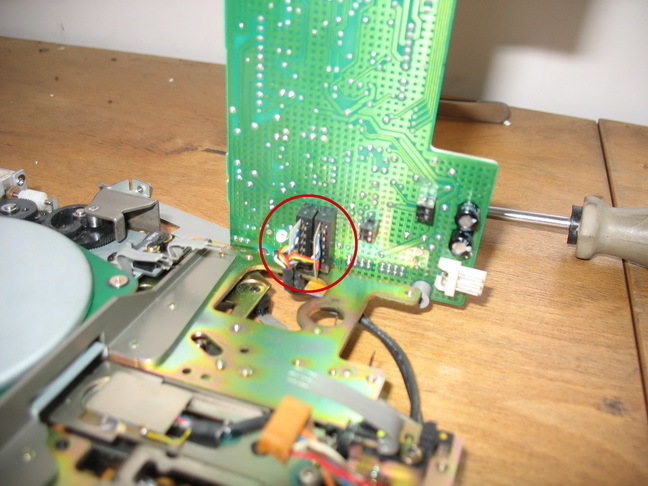 Try my other tutorial on floppy drive repair before doing this. Only low profile capacitors are used in these drives so make sure that you buy the smallest you can get. If in doubt, take one sample to your local shop when purchasing. Soldering wick/braid will come in handy in removing the old capacitors and cleaning solder from holes where capacitor legs used to be. I used an 8 Watt 12 Volt micro soldering iron just to be on the safe side. 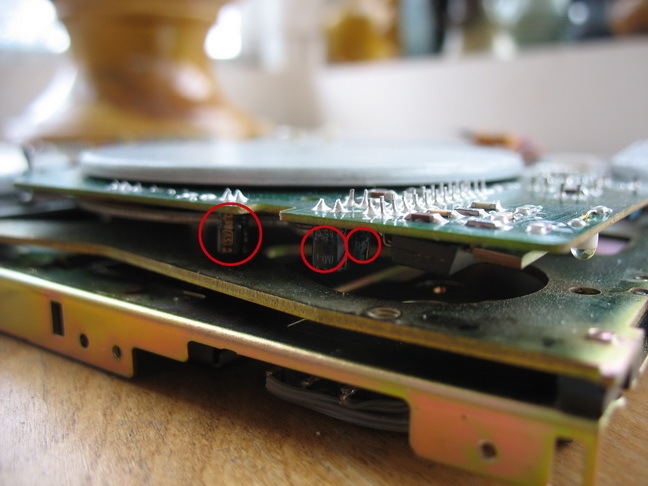 When replacing capacitors, be sure to note the polarity. Unscrew the four circled screws. Disconnect the signal cables by pulling them in straight direction away from the socket. 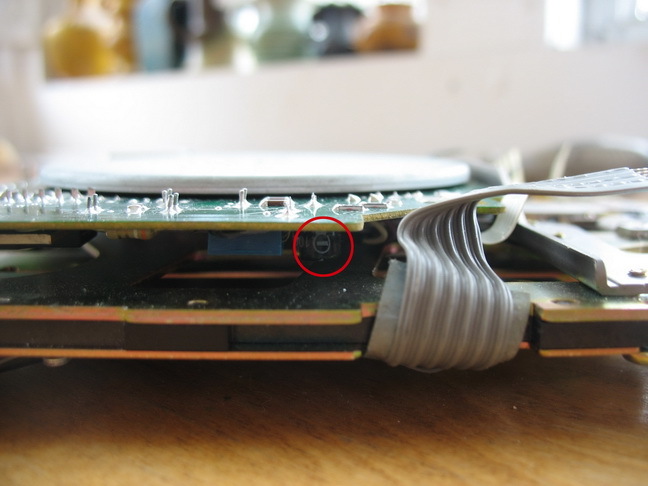 Use tweezers to gently disconnect the big brown signal cables and use extreme caution when disconnection the signal cable which goes to the step motor. Grab its wires tight at the base of the plastic so that they are not loose and gently jiggle the plug out of the socket. 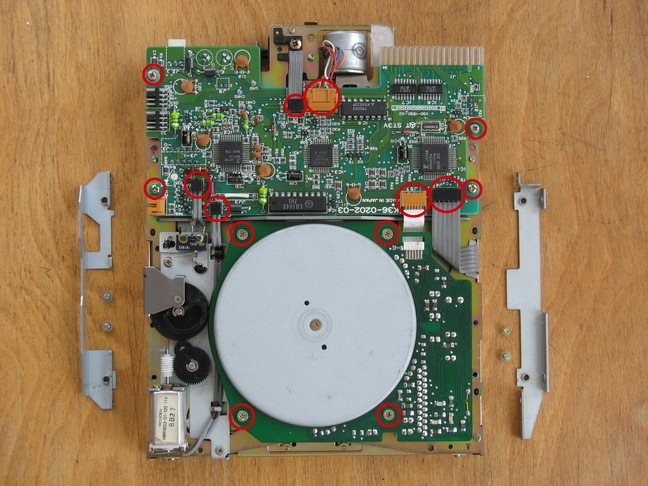 Unscrew the eight circled screws. 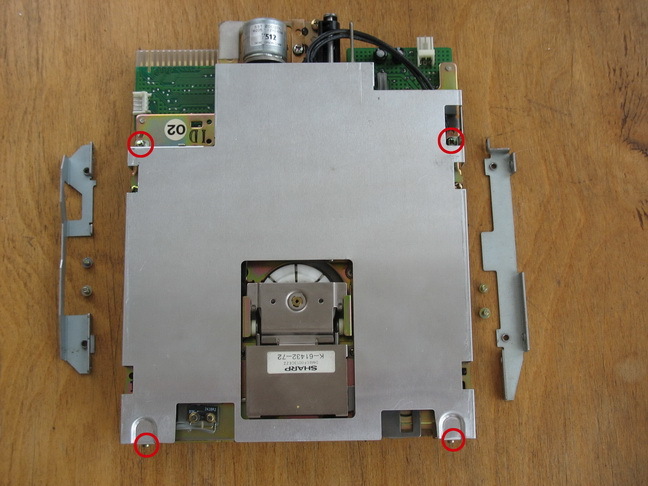 Please note that by unscrewing the four screws from the rotating disk assembly allows better access to capacitors and makes replacing them a bit easier. Disconnect the two circled signal wires. 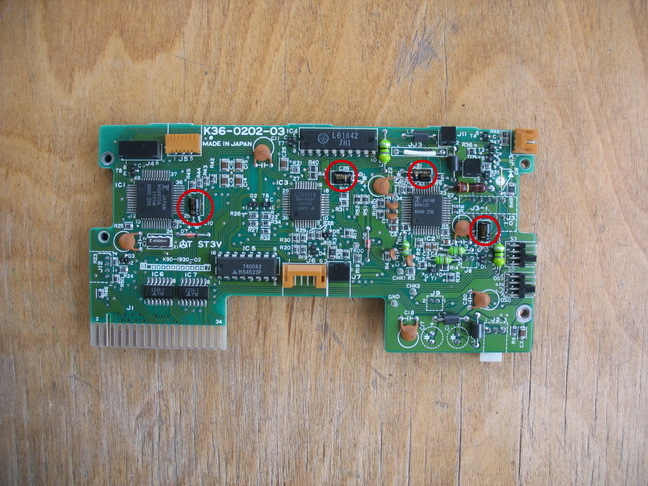 While holding the controller PCB in this position, gently grab (with your fingers) the plastic base of the signal wire, and gently wriggle it out of the socket. Repeat with the other signal wire. Use tweezers to get them in position. This task is rather tricky. Replace the last 100uf 16v capacitor. This one is the trickiest of them all. When everything is done carefully reassemble the drive.